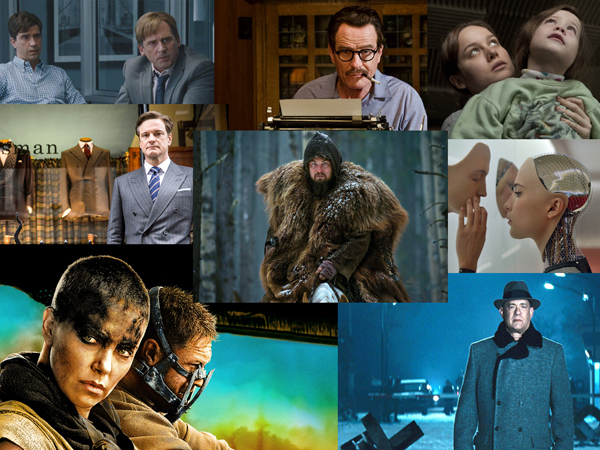 It’s Joel Radio’s annual recap of the best and worst movies of 2015, as Corey Hall sits down to chat with Joel who furiously watched nearly a movie a day to bring you his list. It was a down year for movies, but each guy gives you his list of 15 faves plus others they liked including tons of good documentaries, with Joel reviewing every movie nominated for an Academy Award in the major categories. There’s the worst movies, too, like the mess that was The Hateful Eight, the “Oscar bait” movie that is actually cringe-worthy camp, and Johnny Depp getting picked in the worst by both guys – for two different movies! The guys also do their Oscar predictions and tell you why Sylvester Stallone won’t win. If you’re looking for something good to watch, let this show be your guide, and even though it’s long it’s still shorter than The Hateful Eight! Remember to take an intermission! Some of the images of the best movies of the year. There’s no room for the 70mm Hateful Eight! Just kidding – it sucked.